While I’m definitely more of a coffee person, I have come around to tea as time has gone by. One of my favorites, especially when I’m feeling under the weather, is Earl Grey – it’s a classic that I’m convinced has healing powers when mixed with honey and lemon. 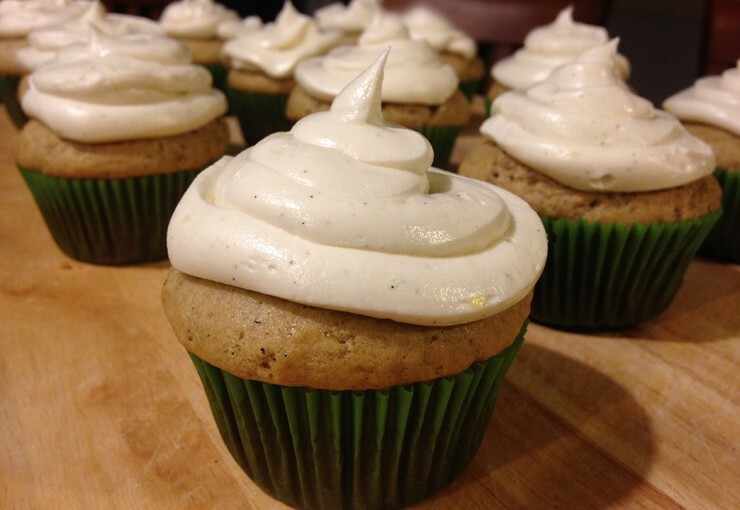 That gave me some inspiration for this unique tea cupcakes baking project – baking the subtle bergamot flavor from Earl Grey right into the cupcakes. I did a bunch of research beforehand to see the best way of imparting the subtle flavor of Earl Grey and I decided to try two approaches. First, four tea bags from our Tea & Cookies basket line steeped in half and half for a half hour (that’s a lot of halves) before getting mixed into the batter. Then, I prepared some tea butter which was a little bit of a pain to do, but the flavor in the end result cupcake was strong, so the effort was worth it in my mind. It probably would have been easier with more of a loose leaf style of tea, but I opened up the tea bags and used that so it required a few more times through the sieve to leave the tea particles behind. The lemon sugar in the batter from our Taste of Europe basket was a nice touch as well – it had pieces of lemon peel mixed in with the larger sugar crystals for some texture in the final product. Hope you enjoy the cupcake version of tea with honey and lemon – maybe the cupcakes have healing powers too, you never know. Heat the half and half in the microwave until it’s just boiling – do this in 20 second intervals (took about 3 intervals for me). Place the tea bags in the half and half and let steep for 30 minutes. Discard the tea bags after the 30 minutes is up. Preheat the oven to 350° Fahrenheit and line a muffin tin with cupcake liners. Sift cake flour, baking powder, baking soda and salt in a bowl and set aside. Add yogurt, vanilla extract and vanilla bean paste to the tea-infused half and half and mix well. Beat the tea butter and lemon sugar in the bowl of an electric mixer set on medium high until well combined. Turn the mixer down to medium and add the eggs until they’re just blended together. Turn the mixer to low and add half of the flour mixture, mixing only until just combined. Add the half and half liquid mixture, again mixing until just combined. Add the rest of the flour mixture until just blended but be sure you scrape down the edges to get everything mixed well. Distribute batter among the cupcake liners and bake for 15-18 minutes or until a tester inserted in the middle of a cupcake comes out clean. My oven takes longer to bake so it was closer to 18 for me, but check yours for doneness at 15. Be sure to rotate the pan halfway through cooking time for even baking. Transfer pan to a wire rack and let the cupcakes cool completely before frosting. Beat the butter on high speed in an electric mixer until light and fluffy, 3 minutes. Add in half of the sugar and once combined, add in the honey and vanilla bean paste. Beat in the rest of the sugar until combined then add the lemon juice, heavy cream and lemon zest. Change to the whisk attachment and whisk on high for 6 minutes, until the frosting is light and airy.